Almost three years ago in the middle of 2010, we started kicking around a crazy idea. I think Maggie and I were having dinner with Hugh Chappelle (our wine consultant, but most of you know him as our winemaker from years past), and he opened up a bottle of a Grower’s Champagne from France. It was beautiful, and our conversation turned to how we could make such a product here in the El Dorado appellation. It just so happened that Hugh had been studying about Growers Champagnes (small producer Champagnes (often Estate Grown) that are made in the traditional style) and was kicking around making one himself. And it didn’t hurt that Maggie LOVES Champagne. So the talk became more serious. First of all, everyone knows that we cannot make Champagne here in California (as Champagne only comes from the region of Champagne in France). Instead, we would be making a sparkling wine. But for us, the whole idea was to showcase the fruit from our vineyards and do something that no one else had done (to our knowledge) in the Sierra Foothills. Now before you start bringing up names of wineries in the Foothills with sparkling wines, we probably need to talk business. Sparkling wine is expensive to make. It takes specialize equipment for the production that only a few wineries in California possess. Thus the “norm” for wineries in California wishing to add a sparkling wine to their portfolio would be to purchase a “shiner” (a bottle of wine with no label) and have their logo and name affixed to it. Thus, Sierra Foothill wineries (or Lake County wineries, or whatever) would have a wine from a different region where the producing winery had purchased the fruit (such as Sonoma). This is not uncommon, and is a smart business decision. But being a winery believing in Estate Grown fruit from our vineyards, we weren’t expecting to go the route of a smart business decision. If anything, we had something to prove– El Dorado grapes can make great sparkling wine! So how would this all work? Here’s the process in a nutshell. We would make a Chardonnay (a traditional variety for making a Blanc de blancs—Pinot Noir is for making a Blanc de noirs) out of our fruit. 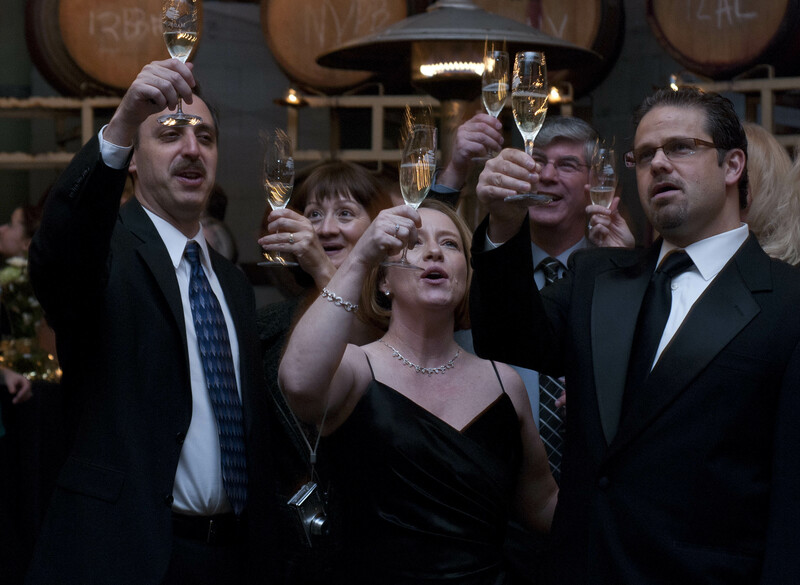 After about 4-5 months, we would send the finished wine down to a facility that makes sparkling wine. Our wine would live there for a year or more, going through the production process. 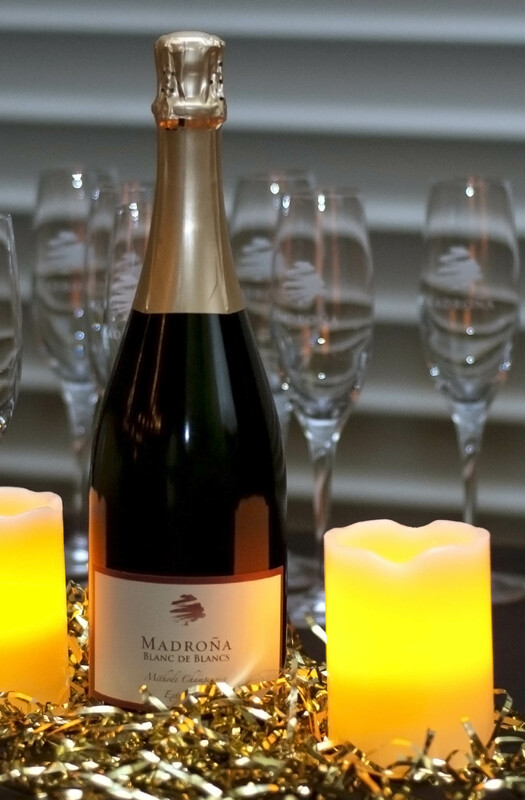 Then just before New Year’s Eve, 2012, we would get the wine back at Madroña all nice and sparkly. This actual process for making a sparkling wine is rather complex. We deliver a finished wine (completely fermented dry, heat and cold stabile and filtered) down to the expected sparkler producer. They proceed to bottle the wine and do the tirage, adding the liqueur de tirage (basically a predetermined sugar, yeast and wine combination) to produce a secondary fermentation, giving the wine the bubbles. Next, the wine ages for a year or more (the longer the better) on the lees (the dead yeast from the tirage). This gives the wine more texture and complexity. The next step involves getting the sediment down into the neck of the bottle to be taken out. The process is called riddling, giving the bottles a slight turn and knocking them, all at a slight angle. The lees will slowly move down the neck of the bottle (over several weeks) until the sediment is all resting on the cap of the inverted bottle. The disgorgement of the sediment requires freezing the very end of bottle, allowing the winery to pull the plug of lees out without losing any wine. Immediately at this point, the winery can adjust the wine style with an addition of a liqueur d’expédition (a mixture of sugar and wine), balancing out the bracing acidity of the sparkling wine with sweetness. The process is called the dosage. No dosage makes a Brut Nature style. A small addition will make an Extra Brut or a Brut, and a larger addition will make a demi-sec. When we started getting close to the potential date of harvest, the whole idea of making a sparkling wine became real. Hugh had given me some parameters on picking the grapes, and we knew we were going to finish the wine at Rack and Riddle in Hopland (a friend’s winery over near the coast, specializing in sparkling wine). But when I actually started to sample the grapes, I just thought we were crazy. Normally when picking Chardonnay for our Hillside and Signature collections, we harvest somewhere between 22 and 24 degrees brix (essentially percent sugar). However for this sparkling wine (which will see a secondary fermentation in the tirage), we need to pick at a much lower level, somewhere between 18 to 20 brix. I crushed the initial sample and called Hugh with the results. “But once you get past the tartness, what are the fruit characters?” he asked again. The fact was, I had never tasted grape juice so “under ripe.” I couldn’t discern individual characters, and the juice was stripping the enamel off my teeth. So to a degree, we harvested this 2010 Chardonnay on faith, knowing that wineries in Champagne have been doing this for centuries. I whole-clustered (no crushing) the fruit, separating the “free-run” from the pressed portion of the juice. Kept cool in tank, the wine fermented cleanly and nicely. It was at this point that we could start tasting some of the characters of the wine, notably lemon/citrus. Some five months into the Chardonnay’s life, my dad drove our flatbed down to Hopland with a 550 gallon tank on the back. It was at this point that we said “goodbye” to our wine for the next year and more. It wasn’t until August the following year that we were called back in to start looking at the dosage. We had tasted our sparkling wine once earlier on some bottles sent to us, but this tasting was the important one. Maggie and I stopped by Rack and Riddle where Penny (their winemaker) had set up a dosage trial for our wine. We sat down and proceeded to taste. First, there was the control (no addition of sweetness). Next was a series of 0.8%, 1.0% and 1.2% additions of sweetness. And here also the questions began. We liked the control, but the other three seemed rather sweet. But sweet, to a degree, is the California palate. But we’re only making a small amount of wine and can’t (nor want to) compete for the California palate. We are truly interested in producing something unique. And unique we did. We blended and adjusted until we found that the 0.2% addition suited us nicely. We asked for a series of 0.1%, 0.2% and 0.3% to be sent to us for retasting on fresh palates two weeks later. In the end, we decided that the 0.3% addition for the dosage made the most nicely balanced wine, but we couldn’t give up our liking of the control (with no addition). We chose to make 165 cases of Extra Brut (0.3%) and 50 cases of Brut Nature (no addition). The Extra Brut was released on January 28th, 2012, and the Brut Nature will be released in the years to come (as it will only improve with age). Now that we have completed the first vintage of sparkling wine, we can imagine making a Blanc de blancs every 2 or 3 years. It’s been a fun couple of years, but truth be told, we excited to finally drink the wine! This Estate Grown Blanc de blancs is 100% Chardonnay from the large block of Chardonnay at our home vineyards in Camino. Planted in 1973, the vines produce grapes with intense citrus notes and hints of pear. The unique aspect of our 2010 vintage of Blanc de blancs is the lemon/lime zest characters intertwining with yeasty richness of the wine. Fresh and inviting, the palate drinks dry yet balances the bracing acidity with a wonderful texture. Enjoy this wine with salty dishes or age it out for the future! This entry was posted in Events, Paul's Blog Posts. Bookmark the permalink. The viticultural and winemaking practices of making sparkling wine have many similarities to the production of still wine with some noted divergence. At the vineyard, grapes are harvested early when there is still high acid levels . In areas like Australia, winemakers aim to harvest the grapes at 17 to 20° brix . Unlike still wine production, high sugar levels are not ideal and grapes destined for sparkling wine production may be harvested at higher yields . Care is taken to avoid tannins and other phenolic compounds with many premium producers still choosing to harvest by hand rather than risk mechanical harvesting which may split the berries and encourage maceration between the skins and juice. The press house is often close by the vineyard to where the grapes can be quickly pressed and separated from their skins. Red wine grapes like Pinot noir can be used in the production of white sparkling wines because their juice is initially clear and is only later tinted red through exposure to the color pigments in grape skins. While some skin exposure maybe desirable in the production of rosé sparklers and some blanc de noirs (white of blacks), most sparkling wine producers take extended precautions to limit the amount of skin contact. Just the right amount of information, Paul. Very interesting!!! Originally not an admirer of American sparkling wine at all. Decided to go to Reim to see if authentic champagne was any different….it IS and I, like Maggie, loved it. 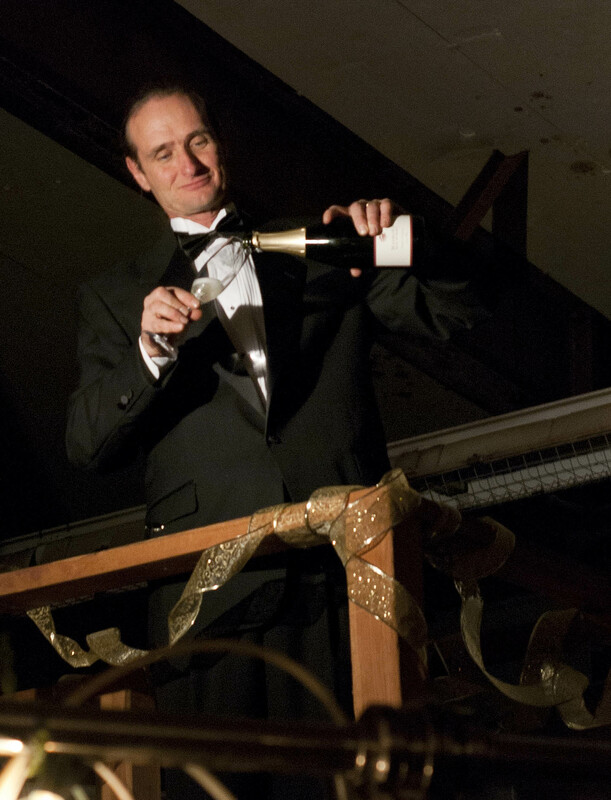 Reim has many small, family owned wineries like yours, and the big ones also. The big guys are great for tours, standard champagnes and to walk the chalk cellars . The small houses like G. Tribaut in Hautvillers made for the local taste, drier like your Brut Nature may be. Of course Italy has Pro Seco, not the big punch of champagne but nice. So glad you are venturing forth!! Very cool Paul, can’t wait to try it! I tasted the Blanc de blancs at the Art and Wine Fest on Saturday. Thank you and congratulations. The best foothill sparkling wine I have tasted, no contest.